If the recent sales of Big Grand Cay and Innocence Island have got you in the throes of auction fever, you certainly won’t want to miss out on this next freehold private island auction opportunity: Binnewith Island – a half-acre island with an oh-so-tempting guide price of just GBP 80 – 85,000. Whilst it might not boast the white beaches and blue skies of these aforementioned Bahaman beauties, Britain’s Binnewith Island is certainly not without its charms. 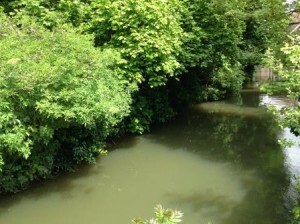 Located within the winding Great Stour River, in the popular cathedral city of Canterbury, this half-acre island currently stands vacant apart from the dilapidated remains of two concrete-framed buildings. But don’t let that put you off – with its picturesque surroundings and close proximity to the town’s top tourist attractions (Canterbury Cathedral is just 5 minutes’ walk away); the true potential of this unique private property is clear to see. Forming one of the last undeveloped sites within the city walls, the possibility of a tourism development in particular is an enticing prospect. Currently accessible only between the hours of dusk and dawn, there’s certainly no danger of any unwanted intruders descending on your island idyll –the gates to the tiny bridge that connects Binnewith to the mainland are actually locked at night by the local council, who own and operate the footpath leading up to the island, making this a very private island indeed! Despite standing vacant for the past few years, the island has a long and illustrious history and has housed everything from a local bicycle repair shop (its most recently recorded use), to a chapel – established in the 13th century by Francesco Bernadone of Assisi and used by the Grey Friars in an attempt to assist the victims of a rapidly growing urban population. Interestingly, Private Island News can confirm that this is not the first time that Binnewith Island has gone to auction. Indeed, the island last went under the hammer just over a year ago, attracting GBP 145,000 from a private buyer – almost three times more than its original guide price. Can the island repeat its auction success again? There’s only one way to find out – stay tuned to Private Island News to find out the results next month! The auction of Binnewith Island is scheduled to take place at 11am GMT on Monday 16th June 2014 at the Clive Emson Conference Centre in Kent (Great Britain). Contact the Private Island News Editorial Team for further details or drop us a line on Facebook or Twitter.